Get out the prayer beads. 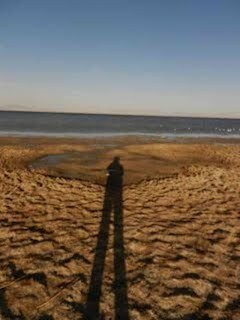 After all the rough and dangerous travel through uninviting terrain, the preparation, the stocking up on noodles, Snickers bars, bottled water, the acclimatization, the adaption to hole in the ground toilets and no sinks, the obligatory stop at holy Lake Manasarovar - push has come to shove. Can I do it or not? 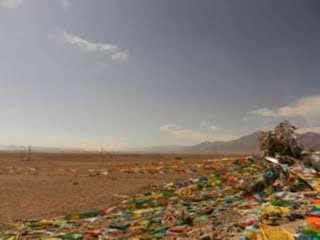 Tomorrow we set out for the Kora, or holy circumambulation of Mt. 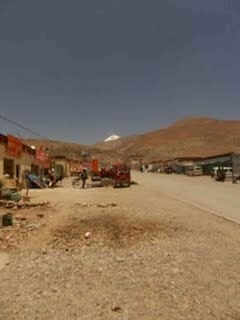 Kailash, a white domed mountain where Hindus and Buddhists believe creation began. The holy site have attracted Indians from across the border for at least 1700 years. A Hindi poet Kalidasa wrote the waters of Lake Manasarovar are "like pearls". Drink of them erases sins of a hundred lifetimes. But the waters are foul and filled with parasites. No one fishes the Lake. There is said to be only one kind of fish, one with teeth, that when it dies, it flips onto the shores and then people collect the fish, dry them, then make a broth to be given to pregnant women or animals to make birthing babies easier. We spent the night in a water front guest house. There has been a boom in guest houses of the primitive style - there is still no way to ignore you have to walk outside in the night to the open aired "corral" to take care of business. There is no electricity and the rooms are cold. If you want to bathe, pour hot water into a plastic bowl and have at it. Well, the window in mine room at least had a view of the lake. That's something, I guess. 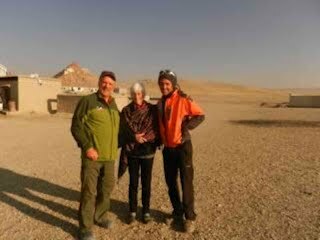 We had a warm meal in the eating room where a group of Russian and a group of Italian tourists led by a climber name Carlos were also preparing for the Kora. So far I'm the only American I've run in to but who knows what we'll meet along the holy roads as we pray our prayer beads pleading with God to get us through the pass (18,180 ft) and keep us healthy. I have the luxury of a pony to ride when times get tough on the steep ascent part. We may finish the Kora in 3 days or 4 days depending - on me, I guess. I'm slow. We will not have any electronics but one satellite phone - and I'll be anxious to get back to a place where I can continue the blogs. We've even resorted to recharging the MacBook Air in the car (special plug) while I write away on the long hauls. The guest houses no matter where look like a motel concept. A strip of rooms one beside the other. Floors are concrete. Walls are concrete. Doors are metal or wooden and usually a curtain hangs over it. For years in Tibet there was one per zone (and in some instances that's still true.) 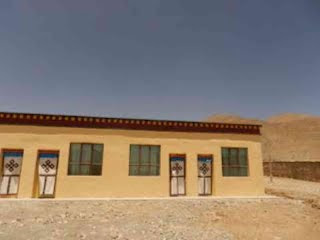 But now that China has taken interest in Tibet and more foreigners come to experience the Kara - especially at this time of the year when the Saga Dawa ceremony takes place on the June full moon - guests houses are increasing. Nights are dark in these places. A tiny flashlight helped me to the toilet area. Two women were going too and they had lights on their caps. A full moon is a blessing. In the stillness of the night, when the dogs stop barking, I worry about my family and friends and rev up serious prayer that life keeps moving on and upward for them. There's a desperateness about losing contact with each loved one. You don't realize how much they participate in your courage, confidence and peace until you are out in the world alone. When all is severed from that source you grasp for memory and prayer and always feel that no matter where you are rather than being an insider looking out, you are an outsider looking in, and everyone looks at you as an outsider and gives their poor English a try out - cheap, cheap, very cheap. Good. Then there is the loss of information. Do you realize I have no idea what is going on in anywhere in the world? Not even here? I'm a news freak and need my 60 Minutes fix. I guess if I understood Chinese I'd have a chance to learn something at some hotels. CNN and BBC are long gone from these distant places. We went to have breakfast in a little coffee shop yesterday morning before we left Saga (a rather bustling truck stop kind of city) and the proprietor had the TV on - An NBA playoff game. Whoopee. I saw about five minutes before we headed to the grocery to get supplies. But as we reach today, behind all is the question can you do the task and not give up? This is so far from my comfort zone that I wonder why I take these risks. It's learning about how the rest of the world lives, and how to reduce my needs to see if I can survive whatever might be thrown at me. 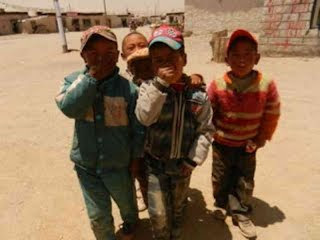 I have learned that Tibetan people are beautiful and friendly. Their teeth are so white with their smiles. Children have great rosy cheeks. The women's dark skin, augmented by rubbing yak butter into it daily, glows and their long black hair is usually in some form of a pigtail. Most women wear masks to cover their faces from the dirt and sand so it's hard to see their beauty.And they wear the Tibetan long dresses with a striped apron no matter what they do. The women really fill the temples and monasteries with their religious acts and petitions. They strap children to their backs and bow over and over before the figures of Buddha. I admire their loyalty but more how they get it all done in a day with such devastating conditions. How to keep healthy with all the filth and garbage and the undrinkable water (everything must be boiled) must be a primary concern. The winds are tough and strong. Cleanliness is the enemy. Bottles, tissues, wrappers, socks, whatever mixes in with the gravel. But women who do work alongside men at tables set up on rustic roads usually depend on income from the crafts they sell to tourist. Here in Darchen where we launch our Kora the streets and storefronts are full of merchandise related to trekking and to hanging prayer flags. 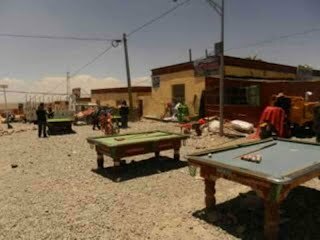 But curious are the pool tables in front of the shops where men leisurely play pool most of the day here in distant western TIbet. Pray for strength and understanding. 7. Pool tables on the streets of Darchen. Oh my gosh Audrey, what an adventure! We miss you so much but know that you are having the time of your life! I must have flush toilets, you are my hero! Commenting is not as easy as you might think, a lot of hoop jumping and you know me,computers and I are frenemy's! In this blog, you explained why you are enduring all of these personal hardships. Now that you are once again experiencing this side of life, hopefully you're next adventure will be to some fabulous place with all of the amenities and luxuries life has to offer. We are really looking forward to taking that trip with you via your blog. Be safe and please come home soon.